24. 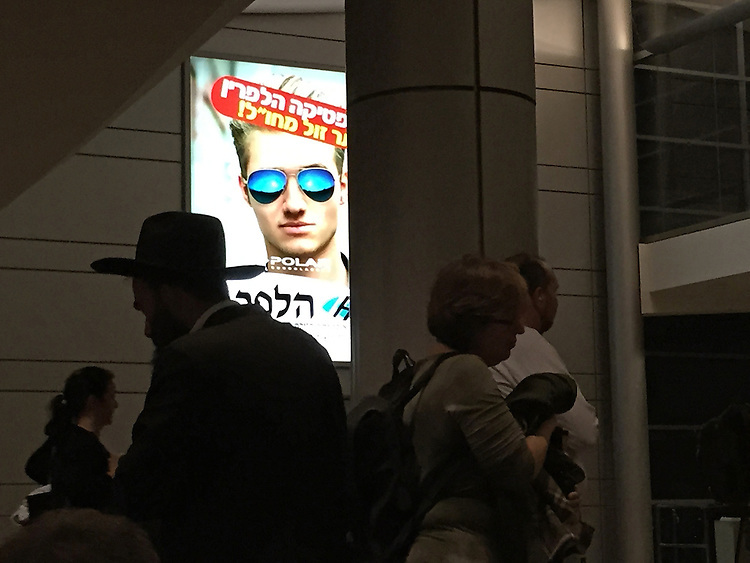 "Polarities at Ben Gurion Airport": a Hasid ultra-orthodox Jew paired with secularized travelers who walk by an advert for polarized sunglasses, near Tel Aviv. As I prepare to return home after honoring my parents by planting a tree, I see this apocryphal scene at the airport. A Hasid is walking one way wearing traditional religious garb, while travelers dressed in more modern, secular clothing walk in the opposite direction. In the background, a spotlit ad features a fashionable young man wearing polarized sunglasses. Surely, this image highlights Israel's polarities! Looking at it, I wonder what values will ultimately triumph in this complex land. Will superficial, destructive desires outweigh kindness and understanding? Will we ever make peace and find common ground? And will I go back to Israel to see what transpires? I haven't decided. But I hope Israel will be there, despite its thorns and brambles, should I choose to return.